Oh, hey, were you already too stressed out about the availability and value of Nintendo's Amiibos? Maybe don't look at this image then. 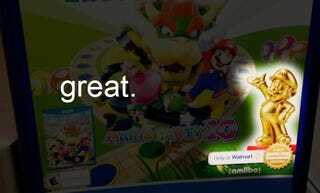 It's reportedly a photo of a banner ad for Walmart, and shows not only a Golden Mario Amiibo itself, but also says that something (it's unclear whether it's the Amiibo or just a Mario Party bundle including it) about it is exclusive to Walmart.